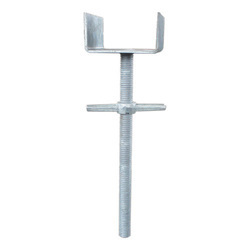 Leading Manufacturer of stirrup head from Chandigarh. We have gained immense popularity in the market for offering a high quality range of Stirrup Head to the esteemed clients. These products are appreciated in the market for their dimensional accuracy, durability and corrosion resistance. Moreover, we make sure to design these products at our sophisticated unit by employing latest technology and advanced machinery. 50 - 250 mm adjustment (32x350): made of 350mm long, 32mm dia M.S. solid rod. 50 - 350 mm adjustment (32x450): made of 450mm long, 32mm dia M.S. solid rod. 50 - 450 mm adjustment (36x600): made of 600mm long, 36mm dia M.S. solid rod. 50 - 500 mm adjustment (38x600): made of 600mm long, 4mm thk, 38mm OD pipe.